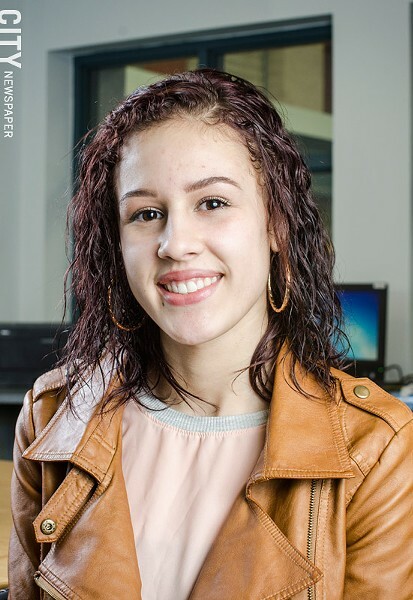 PHOTO BY MARK CHAMBERLIN Adalis Santiago says that most students at West Irondequoit High School don't know that she's part of the Urban-Suburban program. Adalis Santiago says that she's happy to soon be graduating from West Irondequoit High School. But when the tall, poised teen first arrived at the school six years ago, she says it was a complete culture shock. "I was so scared," Santiago says. "It was really hard at first." Santiago, a Latina, came from a Rochester city school where most of the students are nonwhite, she says, while West Irondequoit is the opposite. She transferred to Irondequoit through the Urban-Suburban Interdistrict Transfer Program. Santiago, who lives in the city with her family, attended School No. 5 and was accepted into the School of the Arts. "I did want to go to SOTA," she says. "I got in for dance and most of my friends were going there." But Santiago's parents were not impressed, she says, with the city school district and made other plans for her education. Santiago's mother, Jackie, heard about the Urban-Suburban program from another parent and immediately pursued it. According to its mission statement, the purpose of Urban-Suburban is to voluntarily reduce racial isolation and the segregation of academic opportunities in the City of Rochester's elementary and secondary schools. Only minority students, as defined by the State Education Department, are eligible, and they must live in the city at the time of their application. But as recent events in the Spencerport school district show, Urban-Suburban evokes strong reactions on a wide range of issues: school choice, the powers of school boards, parents' rights on educational matters, diversity in the classroom, and most certainly, race. After some emotional and sometimes contentious public meetings, the Spencerport school board unanimously voted last week to join the Urban-Suburban program. And school officials in at least two more Rochester suburbs, East Rochester and Hilton, are seriously considering joining. Jackie Santiago says that the heated arguments in Spencerport upset her; it's a program involving just a small number of kids, she says. She's so impressed with the program that she got her son into it, too. He now attends the Pittsford Central School District. "I think it's a great program," Jackie Santiago says. "I wanted my kids to have a better education and to socialize with all kinds of people. I was worried that the other parents would treat the Urban-Suburban students differently. And they don't." But participation hasn't been easy, she says. Transportation, for example, is a juggling act, particularly with older students who participate in afterschool activities. But she says it's been worth it. Despite New York State's dubious distinction as having the most segregated schools in the country, programs specifically designed to mitigate the problem are not as common as you may think. There are less than a dozen programs like Urban-Suburban in the country. The program has been operating for more than 50 years, with Spencerport making eight participating suburban districts. But it's not without controversy. Critics of the program in Spencerport, and there are many, raised numerous questions about Urban-Suburban's purpose and much-touted success. Does it create diversity in school systems? Is a program like this still needed? Is it implemented fairly, since not all students qualify to participate? And does it actually help the city school district if the district's more engaged parents and students leave for the suburbs? About 5,000 students have participated in the program since it began, according to officials at Urban-Suburban. Currently, there are 587 Urban-Suburban students in Rochester-area participating districts. Accurate graduation numbers are difficult to come by since many students transfer in and out of the program. The West Irondequoit School District was the first suburban district to participate in Urban-Suburban. And Superintendent Jeffrey Crane says that he supports the Spencerport school board's decision. "I'm amazed at the kids I've seen in how they deal with their different environments each day," he says. "You've got kids getting up at 4 and 4:30 a.m. to get to the school they've been assigned to. They stay late and participate in sports and all levels of extracurricular activities." Public education must prepare students for the society that they will enter and in which they are expected to perform, Crane says. "If our kids haven't had that kind of experience in a diverse society, then they are going to be held back from their abilities to move into the work force, the military, or a two or four-year college," he says. Crane says that Urban-Suburban is relevant and needed, but that he understands the concerns about fairness and equality. White students from city schools, for example, are not eligible for the transfer. "The program was originally meant to mitigate racial isolation only," he says. "Is that still the only way we should look at the program when we know that poverty is really the greatest issue?" But the challenge for the program governance committee, Crane says, is how to adjust the program to account for the socioeconomic hardships that many students face in Rochester regardless of race or ethnicity, and not put the original Urban-Suburban state legislation in jeopardy. He says that the organization is working with its legal team on the issue. The program's selection process also comes under scrutiny for what critics say is creaming the best students and most engaged parents from the city school district. Acceptance into the program is based on a tough review of everything from transcripts to classroom behavior. Rochester school board President Van White says that he supports Urban-Suburban, but that its impact on city schools is similar to charter schools'. "They give parents options," he says, "but we need to be concerned because we need those parents desperately." City schools Superintendent Bolgen Vargas says that his goal is to create options in city schools that are attractive to suburban parents and students. Even though the program allows students from the suburbs to transfer into city schools, it has only happened sporadically. West Irondequoit's Crane says that is the direction he would like to see the program go, too. "A suburban parent without pre-k opportunities in the suburbs, that's one place where we're looking to re-establish the suburban-to-urban connection," he says. The University of Rochester's plans for improving East High School might also interest suburban parents, he says, considering the university's educational resources.